CHICAGO (WLS) -- Six people who were rescued from an elevator in the former John Hancock building, one of Chicago's tallest skyscrapers, later learned the fall lasted 84 floors after two elevator cables broke early Friday morning. The Chicago Fire Department received a call around 12:30 a.m. about six people, including a pregnant woman and two Northwestern law students, who were trapped in an elevator at 875 North Michigan Avenue. The rescue was challenging because the elevator was an express, with very few openings. Here's what to do if you ever get stuck in an elevator. 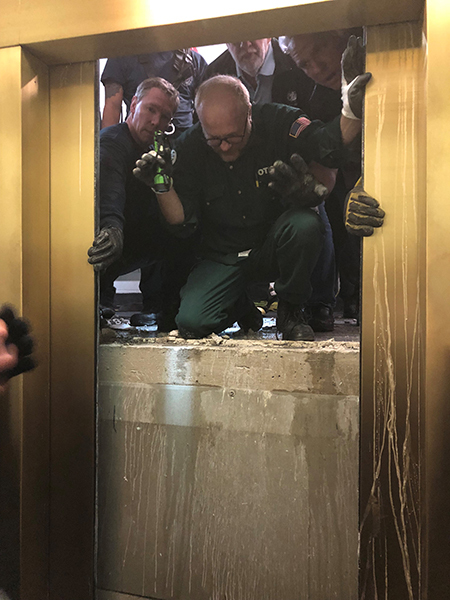 "It was a pretty precarious situation, where we had the cables that were broke on top of the elevator," said Chicago Fire Department Battalion Chief Patrick Maloney. "We couldn't do an elevator-to-elevator rescue. We had to breach a wall on the 11th floor of the parking garage in order to open up the elevator doors." Fire officials said the group had just left the Signature Room restaurant on the 95th floor when they heard noises and experienced a faster and bumpier ride than expected. Luis Vasquez had visited the Signature Room with his friends. After taking another elevator down and not seeing his friends on the ground, he quickly realized something was wrong. "My friends were the last to come down," Vasquez said. "At first we thought they were on the 96th floor. But after 20 minutes, they found they were on the 12th floor." Fire officials said the car actually stopped moving between the 11th and 12th floors. Firefighters broke through a brick wall more than 10 stories above the ground from a parking garage to reach them. The rescue took about two hours. Everyone got out safely. The people who were trapped said they were very grateful to the fire department. Meanwhile, fire officials said it wasn't an unsafe situation, even though two cables broke, since there were many other cables still attached. ABC7 reached out to the building Friday for comment. Officials said the elevator and two others will be closed until repairs are made and officials figure out what happened. The Associated Press and the Sun-Times Media Wire contributed to this report.